1.1 Turkey on the ropes? We watched with joy as the people took the city, the country back. My favorite headline of all time will be: "The people have liberated TRT." The people went in and forced the soldiers to leave the television station. Unarmed people forced soldiers out and liberated the state television station. Several Arab media outlets, including Rai Alyoum, quoted diplomatic sources in Ankara as saying that Turkey's National Intelligence Organization, known locally as the MIT, received intel from its Russian counterpart that warned of an impending coup in the Muslim state. 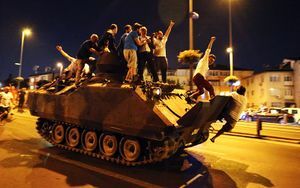 The unnamed diplomats said the Russian army in the region had intercepted highly sensitive army exchanges and encoded radio messages showing that the Turkish army was readying to stage a coup against the administration in Ankara. The exchanges included dispatch of several army choppers to President Erdogan's resort hotel to arrest or kill the president. It is believed that officers at the Russian Hmeimim Air Base in northern Syria, which houses modern intercept systems, were able to capture and analyze encrypted radio messages, revealing the plans of the Turkish military to topple the government and capture or kill President Erdogan. BBC list theories on who was behind the coup, but fails to even mention the most obvious: the U.S.
Never before in history has the US been cut off from its own nuclear weapons, which is Essentially what's happened with the no-fly zone and power shutoff to Incirlik." The coupists had an appointment list according to which the police are making arrests. All positions in non-political civil establishments from the Merkez Bankası (the Central Bank) to TRT (the state-owned media network) and the army were going to be filled according to the names on this list. The list contains over 400 names ranging from generals/admirals to majors. This page was last edited on 8 November 2016, at 05:13.